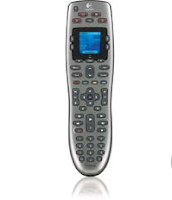 If you are looking for the perfect Father's Day or Easter gift for that special guy in your life, then you have got to check out the awesome Logitech Harmony 650 Universal Remote from RadioShack! With its color screen and one-click activity buttons, the Logitech Harmony 650 Universal Remote will bring you showtime in no time. Constantly updated device database ensures that your remote won't quickly become obsolete. Before I received this awesome Logitech Universal Remote, we had literally four separate remotes to run our TV, DVD, VCR, and DVR/Cable Box. It was SO ANNOYING and so hard to explain to guests and visitors who wanted to watch TV or a movie! I was a little intimidated by this remote when I first opened up the box! The remote looked so sophisticated and complicated. However, once I started the set-up, it was REALLY easy to set up and use! I did it all by myself in a matter of minutes using my computer. There are so many great features about this remote! The best part about this remote is how it can connect and control up to 5 A/V components! We now only need ONE remote for our TV, DVD, Cable, and even our very old VCR! I never thought it would work for our old VCR, but it does! I LOVE, LOVE, love the color screen which makes it so easy to use and see the commands. It offers a great help button, which has really been helpful and we have used it often to help fix a command! To switch between different devices (DVD, VCR, Cable, etc), you just push one single button and it switches so easily! I love that! NO more manually scrolling through inputs or shutting off each component individually! My husband loves that when you switch around, it shuts all the previous components off! I recommend the Logitech Harmony One Advanced Remote for all households that have a lot of remotes or components to their entertainment center! This remote was easy to set up, is great for a first time universal remote user, and is easy to read and get help from a single button. Buy It: You can purchase Logitech Harmony One Advanced Universal Remote for $49.99 on the RadioShack website or at a local RadioShack store near you!